Like many others, Mike (Parax) already bought the new Tractor with Trailer (8063). 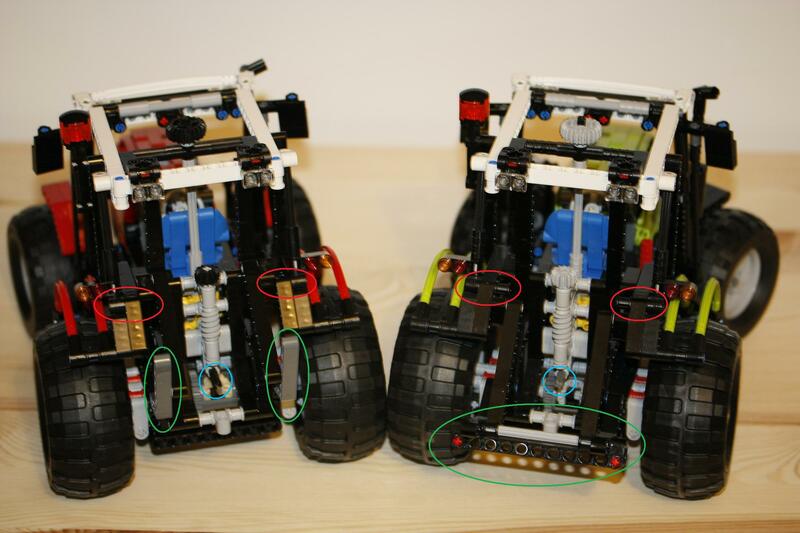 Below some photos, where we can also see some differences among the two 2twin" tractors (8063 vs 8284), besides the evident replacement of the old panels by new ones whose design is aligned with the series of TECHNIC panels. Red - Not a 'long pin with bush', so liftarms raise higher (above trailer). Trailer will not fit 8284 without modification. Green - Built in spacer on 8284 not on 8063, so does not interfere with trailer. Blue - Longer transmission axle, so the rotary equipment from 8284 will not fit 8063 without modification. You can also find some other side-by-side photos, from Mike's Brickshelf folder. Looks like a nice model, and I'd quite like to pick it up. However, the price is not nice. It's £10 less than the 8275 Bulldozer in the UK, and the feature set is on the other end of the scale in comparison. Even compared to the 2009 Front Loader (£70 in UK, £20 cheaper than this) it has very little in the way of features. I'll wait for the Forest Tractor towards the end of the year, as hopefully that will be a little more unique, with better features and less painful price. Guess there might be something wrong, with the 89,99£ price, listed at TRU UK!?? Uwe from Brickset, commented here (post from 3rd Aug) it will to cost 64£ from LEGO brand stores after September, while at TRU US website it is listed for $99,99. Maybe Parax will come here and comment how much did he pay for it in UK, or Eric in US. The trailer is really big! 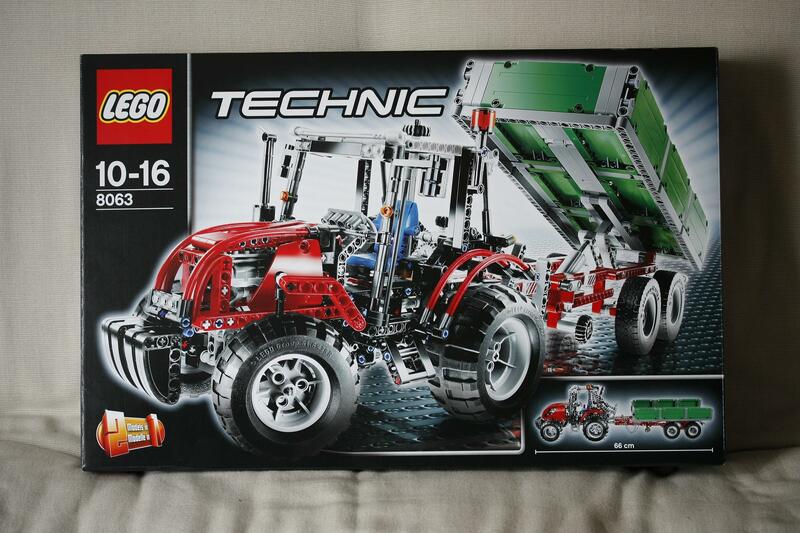 and is well constructed, it is a complete trailer not a shape like a trailer, as with some technic models.. I would have liked to have seen some updates like the new diff and a few of the new parts but the tractor is pretty much identical except for the discontinued panels and replaced axle joiners. yes it is that price in TRU. I'm Guessing taht as the law in the UK means it must be sold at a higher price before it can go on 'sale' I suspect this is a special item which will get discounted once its time at 'full price' is up... in reallity its a false sale.. Yes marketing... Reminds me of Bill Hicks..
£64, hmm I could go with that I think..
Good timing! I was just taking pictures of the differences for my review when I saw your post. Should be posted shortly.